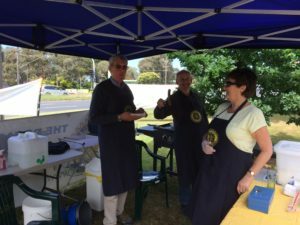 With assistance from a grant from Maroondah Council, we purchased a specially made trailer to house two BBQs, trestle table, chairs, and the Rotary Marquees. The BBQ is used to support community organisations and support fundraising efforts. Recently we have provided bbq’s in the community at Bunnings, Anglicare Foster Family Day, Anzac Day School’s Service, Ringwood Farmer’s Market & Irabina Super Heroes Fun Run, Migrant and Refugee Communities and in support of Liptember.